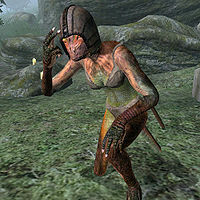 Beewos is an Argonian hunter and devout worshipper of the Daedric prince Sheogorath. She can always be found near the Shrine of Sheogorath and is, like her fellow worshippers, completely mad. While Angalsama worships the three lit candles nearby, Beewos spends her life kneeling in silent prayer behind the lectern, often observed by both Ortis and Gregory Arne. She never pauses to eat or sleep, but will occasionally sit down on one of the benches for a bit of relaxation. Like the other followers of the Madgod, Beewos can't be bothered with too much clothing and only covers her head and feet with a leather helmet and a pair of quilted shoes. She wields an iron dagger and carries around a small amount of gold. When you approach her, she will point you towards Ferul Ravel and share a bit of her madness: "I used to be a dog. I got better. Not a better dog, though. I'm a terrible dog now. Tomorrow...who knows? Ravel may know. Talk to him."